Do you often look outside your patio and wonder how you can bring new life to your outdoor living? Consider these cheap but chic patio ideas and get a brand new looking patio without breaking your bank. Got vintage and rustic-looking wooden frames? Before throwing it out, why not see whether it can be fashioned into a pergola instead? Pergolas made from reclaimed wood stuff not only render your finished product looking great but also give it an original look. Go for medium to high trees, tall shrubs or even bamboo plants and have your very own living privacy screen. Being potted, one can easily move it following the direction of the sun’s harsh rays and prevent you from being roasted while lounging out of doors. Don’t stop on living privacy screens. Try living curtains made of creeping vines and trellises to provide the feeling of cultivated wilderness right in your own backyard. This instantly gives your patio a safe and enclosed ambiance where one can get away from the world’s daily stress. From tree stumps to stone and flagstone, installing steps leading to and from your garden invites further exploration of your backyard. It instigates one’s curiosity into what lies beyond your patio and gives the illusion of space. Nothing spells like something festive like a canopy does. Perfect for when there are gatherings, a canopy drapes your backyard in celebratory glee. Giving your patio furniture new colors easily transforms the look of your garden. Just make sure it won’t clash with your garden’s whole look. 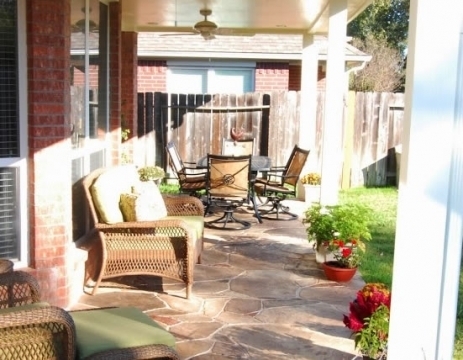 Giving your patio a new look does not mean a hefty remodeling price tag. With these cheap but chic patio ideas, you can keep your patio looking interesting and inviting once again. So you’ve set up your patio with furniture and things to make it an outdoor haven. But you’re not sure if it’s as inviting as you’d like it to be or even comfortable. Browse through our list and see whether you’re still missing something that make your patio the coziest outdoor escape ever! Who doesn’t want a little nap in the comforting sway of the hammock? If you have two strong posts that look empty and can support a hammock, then by all means hang up a hammock there. Fight away the chill of summer nights with a comfortable fire for you, family and friends. It also gives you a great bonding activity of roasting marshmallows and your friends for great stories! If you’re concerned for the environment, you can even opt for a glass fire which does not use wood or any forest by-products, and is odorless! For when the sunlight is too strong and or you require a little bit of privacy, stringing a curtain to the outposts gives you easy access to shade when it is needed. 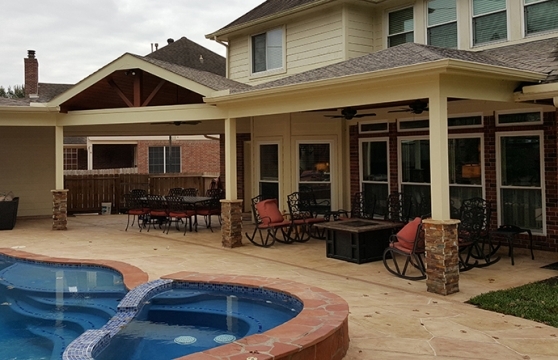 Patio covers don’t just let you enjoy your patio on rainy days. It also helps in protecting your patio and furniture from natural harmful weather elements. You don’t want to replace that furniture every other 6 months, right? Here are a few tips on how to keep your lawn and garden looking nice for a long time. Most people buy plants and ornaments that are hot in the season and do not consider what would it be like after a few seasons. 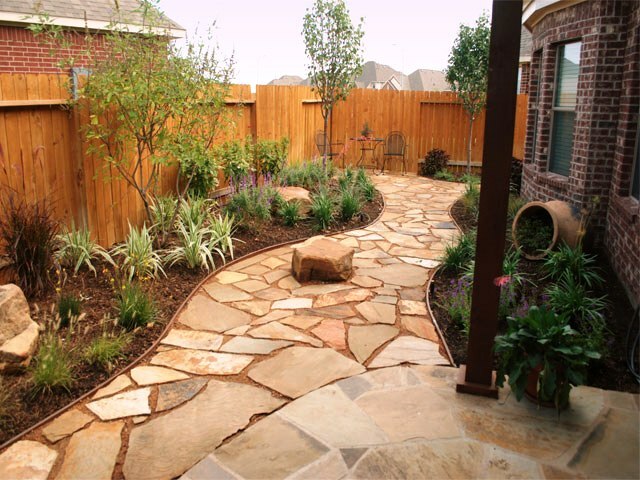 Before embarking on your landscaping project, have a vision of what you want it to be. In your vision, consider many changes that the lawn or garden will go through as time passes; and account for those in your plan. This way, you can make informed decisions and install features that will last for years. Most people assume that when you plant drought-resistant plants, you are safe because they are low maintenance and they require less water. Consider that sometimes storms come and flood your landscape for months killing those plants too. Layer your plants in such a way that you have a mixture of plans that survive in different seasons. Have annual plants and perennial plants as well, such that at any given season, something is blooming. A new landscape looks perfect but when it starts to mature, you realize that some features may require replacing. Plants such as bushes, hedges, and shrubs tend to overgrow and dry out. Trees grow tall and leave spaces in between where they covered when they were younger. Before planting anything, consider the future implications of the plants and have a contingency plan for when that happens. Some plants do well with one another in the long run while others do not. If you have ornamental flowers or a vegetable garden, planting an oak tree next to them is a bad idea. It will grow tall and shade the beds, hence suppressing the plants. You are better off having a bench there or a swing set so that people can relax under the shade. If your landscape can sustain itself, then you will have an easier time. Have plants that shed leaves to provide mulch and humus for the others. Use grass cuttings to make mulch and compost. Install solar powered lighting in your yard to cut down on energy bills. Work with a good water recycling system to water your plants as well as service your water features. Sometimes a lawn with lush green grass will last longer than a lawn with dozens of ornamental plants. When planning your landscape work with materials that will last longer. Choose weatherproof components for your deck and patio. Go for tough water features as well as plants so that they can serve you for a long time. Work with tough plants that can survive for long periods without requiring replacements. Landscaping does not come easy as it calls for hard work and serious thinking. Sometimes you look at home or landscaping design magazines that make you ask how you can get that same results in your own backyard. Here are a few tips on how to plan and landscape your lawn so passers by and neighbors want to take pictures of your yard or garden. You can go through samples of manicured landscapes and come up with a style that suits you the best. Make a theme or a plan around that style so that you have a base to work with. Choose a style that complements your house, hence making it the focal point. Landscape designing can be an enjoyable and fulfilling project when you utilize what you already have. If you have lots of rocks, make a rock garden around them. If you have a water feature close by, create a man-made pond, waterfall or fountain and have a small marine ecosystem in your yard. Use gardens and slopes in your home to create beautiful landscaping features. If you have trees in your yard, you can construct a relaxation bench or swings underneath for people to chat as they enjoy the shade. 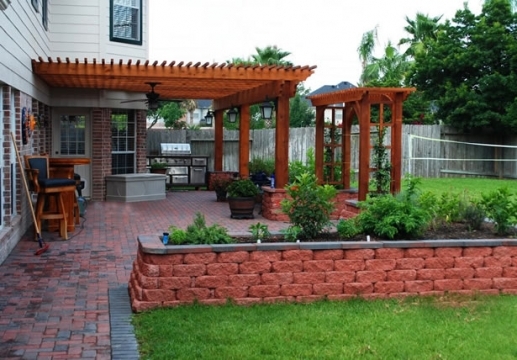 Make sure you maximize the features that you have before buying new landscaping ornaments. Consider the function of your landscape and start with the useful features before adding the ornamental ones. If you have little children, having a play area takes priority than having a backyard bar. If you have senior citizens with not much work during the day, having a flower garden or a vegetable garden is good for keeping them occupied. If you need a guest entertainment area, you can accentuate your patio. After you are done with the basics, then you can move on to other luxury features. Landscaping is more than planting flowers, shrubs and laying rocks randomly. You should consult an expert for advise on soil type, and the plants that would do well with your type of soil. You also get to know about wind and rain patterns as well as how to maximize them. Also, an expert can teach you how to pair perennials with annual plants so that you have a beautiful lawn all year long. They can also advise you on drainage, maintenance and long term landscaping. When making your plan, include a tentative budget of the ideal features that you want to install. This will keep you from making impulse purchases, which might end up costing lots of money. If the price seems too high, you can divide the project in phases and do one phase at a time. You can start with the front yard and move towards the back as you work your way. The concept of an edible landscape might seem new, but in a way, it truly is the oldest existing type of landscaping. The best thing about an edible landscape is that it is not only beautiful and exciting to look at, but it can also provide you with food in due season. Edible landscaping enhances the functionality of the landscape, and since most of Texas has good soil and a reliable amount of rainfall, having such a landscape is a great way to utilize your yard. Plant edible flowers – This might come as a surprise to most people, but there are flowers out there that are edible. Edible flowers can be cooked and eaten as vegetables while others are prepared as salads or used in soups. The most popular types include carnations, marigolds, clover and mums. Herbs have numerous advantages, with the most famous of them being their medicinal value. There are mints of different types, which will also fill your yard with a sweet smelling aroma while they grow, or you can use them in cooking. You can plant rosemary in your lawn and brew it with your morning tea, or you can plant basil and parsley. Include flowering plants that attract bees – Bees can be a nuisance to some people, but to people who know the value of the honey they produce bees are welcome guests. One flower that produces nectar is the honeysuckle, and you can go for either the vine or the bush variety. Its edible nectar is very sweet, though its berries are mildly poisonous and are not to be eaten. These flowers will not only fill your yard with sweet smells; their appearance also makes your yard look even more beautiful. Plant trees that produce fruits – The good soil and climate of Texas makes it possible to plant trees that bear some of the sweetest fruits, and there is no reason you should miss the opportunity of effortlessly growing these fruits. Some of the fruits that you can harvest in your backyard include apples, cherries, grapes, and blackberries. If you have a big lawn and your produce exceeds what you can eat, there is an opportunity to sell your fruits and make some money. Edible landscaping is a great way to make use of your lawn, but you have to be careful not to plant and eat fruits, flowers, or herbs that will pose a health risk to you, your family or your neighbors.